We are a non-profit community organisation: to help us run the Moidart History Group, maintain this website and operate our History House in Glenuig, we welcome donations. If you would like to know more, why not join us? Membership gives access to our Members' Only material. Open Thursday afternoons Easter to September. Also Tuesday afternoons at Easter and in July and August. 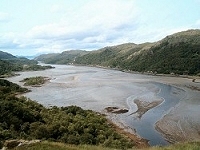 Explore our growing archive about the history, culture, people and places of Moidart. (with refreshments and fast, free WiFi). Precision-engineered plane-table Clyne Alidades, made in Scotland from recycled materials - available for sale online. Order / more information. We comply with the General Data Protection Regulation (GDPR) 2018 - click here to see our statement of privacy.